- First suggestion: quicksave often. This quest is buggy. It’s not long, but it’s buggy. - This quest is a little weird, like many of the quests in Diamond City. In order to trigger it you need to both visit the Dugout Inn, found in the south, and then wander around until someone - probably a security guard - says the Bobrov Brothers are looking for you. They’re the owners of the Inn. I found the appropriate guard in the Stands, not far from the Inn, but the dialogue may pop up elsewhere as well. Talk to Vadim where you last saw him. Not done yet, apparently. He wants you to set Travis up on a date. Speak to Scarlett, the waitress of the Dugout, and you can convince her (or bribe her) to go talk to him. You’ll find her outside, near the northern scoreboard. Once she does, go back to the Dugout and speak to Yefim. Turns out Vadim has been kidnapped. 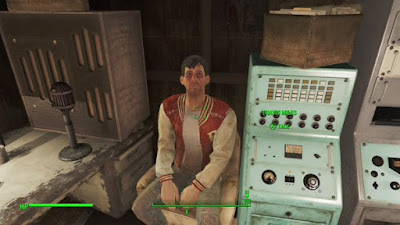 Talk to Travis in Diamond City Radio to figure out where he’s been taken. He’ll decide they must be at the Beantown Brewery.